With over 50 years in the jewelry business, Coin Mart Jewelry has become a household name. Whether you have seen us on television or in the news, heard about us on the radio, or read about us in the newspaper, Coin Mart Jewelry remains San Diego's most trusted jewelry store. Please watch our Diamond Price Guarantee Commercial which is currently airing throughout San Diego county. With over 50 years in the jewelry business, Coin Mart Jewelry has become a household name. Whether you have seen us on television or in the news, heard about us on the radio, or read about us in the newspaper, Coin Mart Jewelry remains San Diego's most trusted jewelry store. Here is a small sampling of places you may have seen us, some of our recent awards and even some family photos. 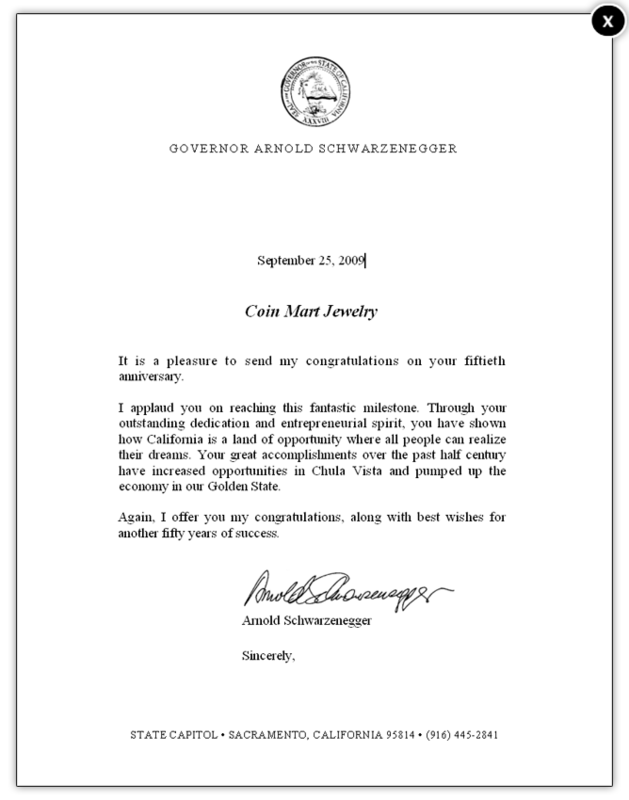 California Governor Arnold Schwarzenegger recognizes and congratulates Coin Mart Jewelry on its 50th Anniversary. 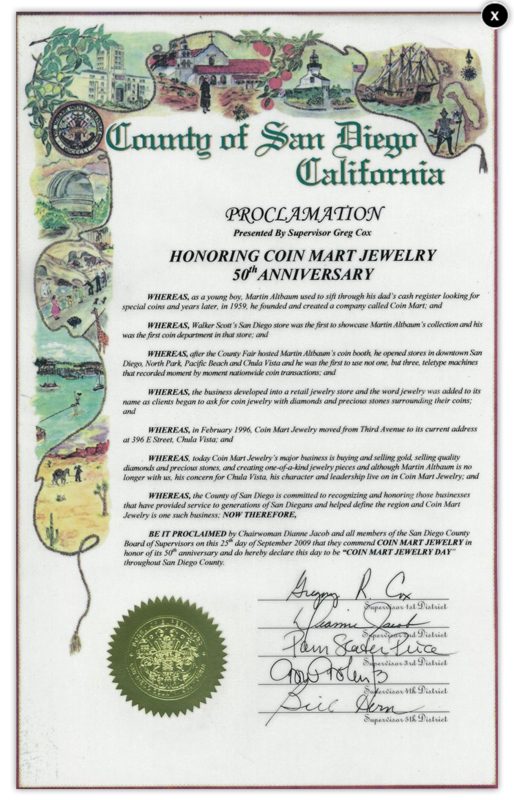 In honor of our 50th Anniversary, San Diego County announces September 25, 2009 as Coin Mart Jewelry Day. 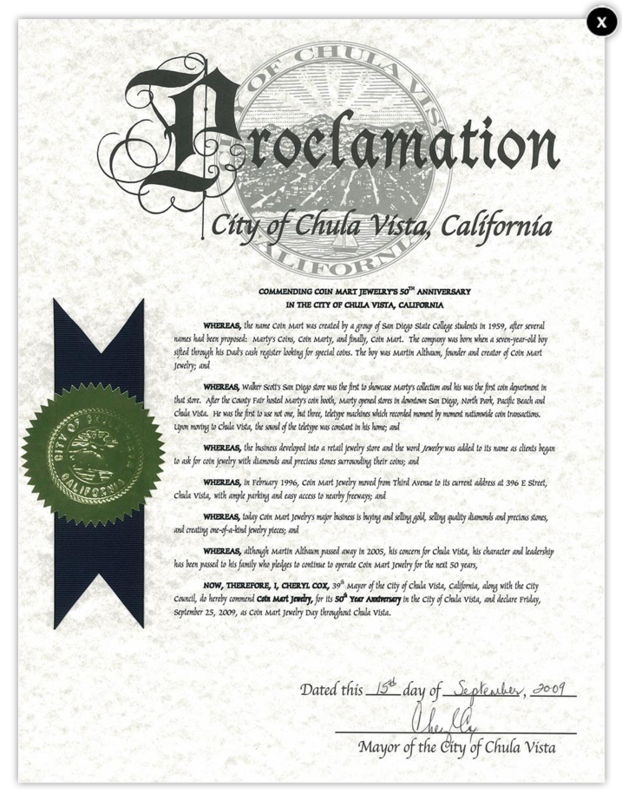 In honor of our 50th Anniversary, Chula Vista announces September 25, 2009 as Coin Mart Jewelry Day. Coin Mart Jewelry is featured in the menu at the Cheesecake Factory in San Diego. 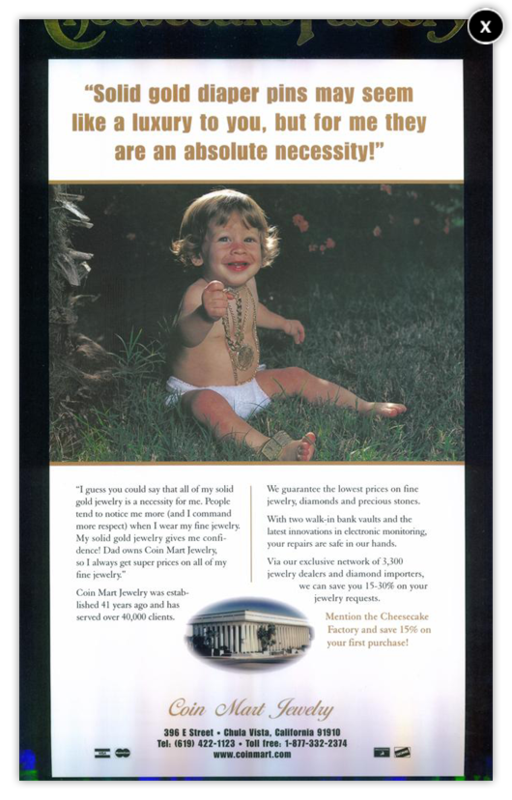 "The Coin Mart Baby" is seen with his signature gold necklaces and gold pin diapers. 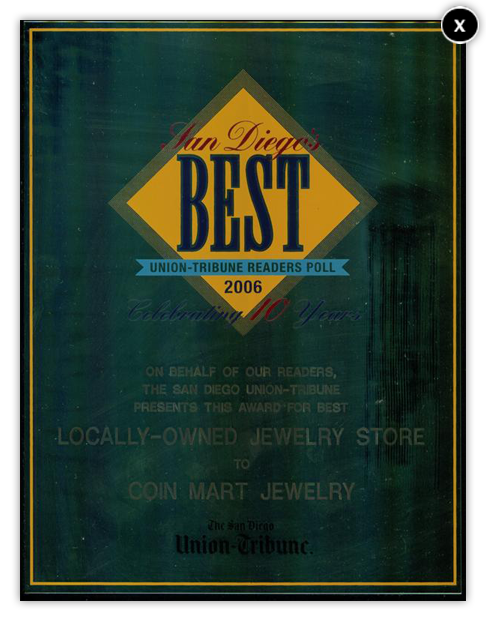 Coin Mart Jewelry is awarded San Diego's BEST Locally-Owned Jewelry Store by the Union-Tribune Readers Poll. 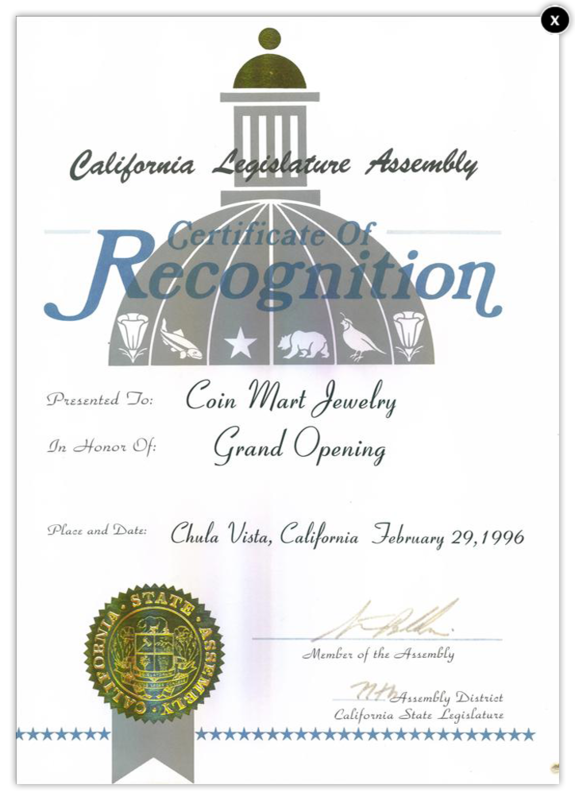 The California Legislature recognizes Coin Mart Jewelry at the Grand Opening Event at our new location at 396 E Street, Chula Vista, CA 91910. Owners Martin and Barbara Altbaum are captured during a magical moment, as they dance the night away during a Lion's Club Charity Dinner. 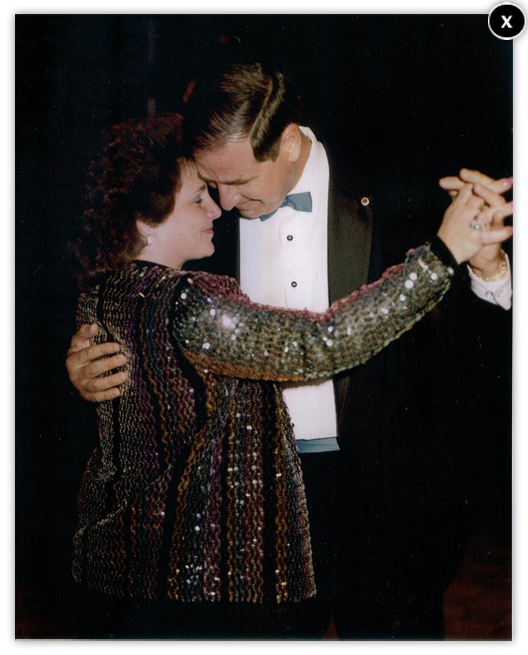 Both Martin and Barbara enjoy donating their time, expertise and income to numerous charitable organizations (photo circa 2000). 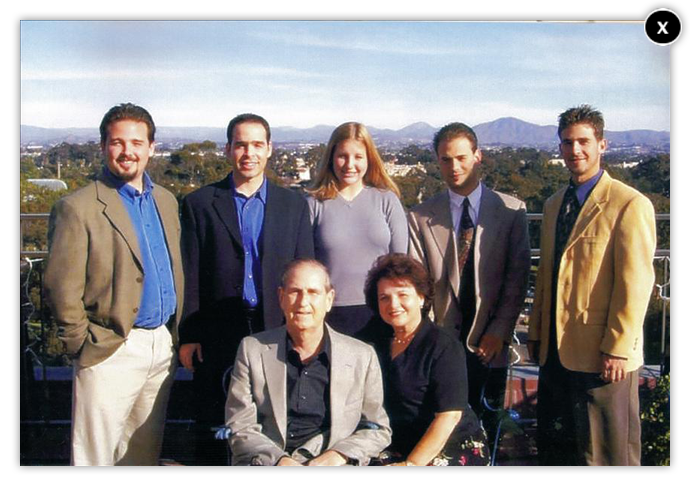 The Altbaum Family, Thanksgiving dinner 2003. Owner Martin Altbaum and son Tim are seen discussing the jewelry business (Circa 1977). 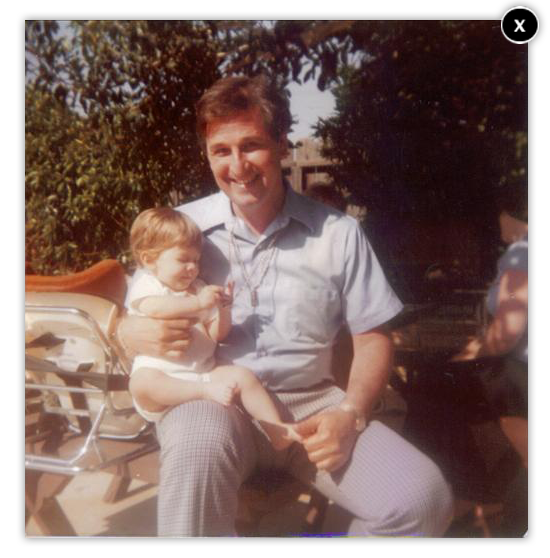 Tim Altbaum will go on to become "The Coin Mart Baby," featured in numerous ads, and still featured on the Coin Mart Jewelry sign at 396 E Street, in Chula Vista, California. 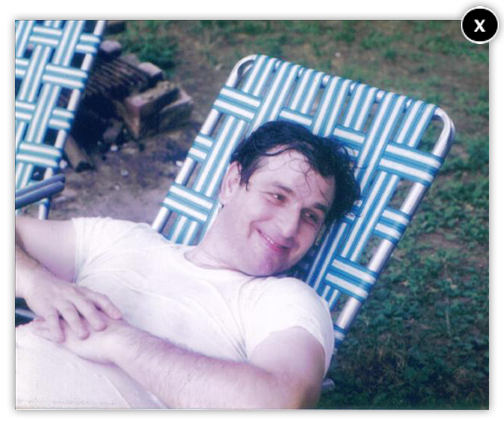 Owner Martin Altbaum and his signature smile are captured in this "dress shirt off" photo (photo circa 1975).